Synopsis: Taking a field trip to a heritage farm, Dan Hogg and his classmates find themselves in danger when a escaped convict appears at the farm. Review&colon; "Middle school readers will appreciate this adventure." "Grant hits the nail on the head when she brings both mucous and underwear into the story line the journey to Dan's personal redemption (that) is most enjoyable Highly recommended." "Dan's wry sense of humor catches readers' attention and has them rooting for him practically from the first page. 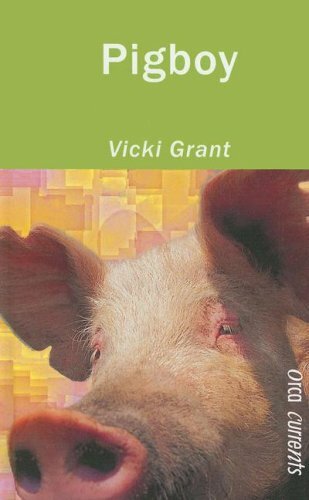 Pigboy is a great quick read for boys who may be reluctant readers, but others will enjoy it as well." "It would suit high interest low vocabulary readers with its brevity and reading level, but the high action and excellent writing, not to mention the likable main character, would make it a good choice for any reader." "This quick read is perfect for reluctant readers, especially boys. In a story of bravery and redemption, Grant moves quickly to first establish Dan's post on the lowest rung of the social ladder, and then chronicles his eventual rise to the top."